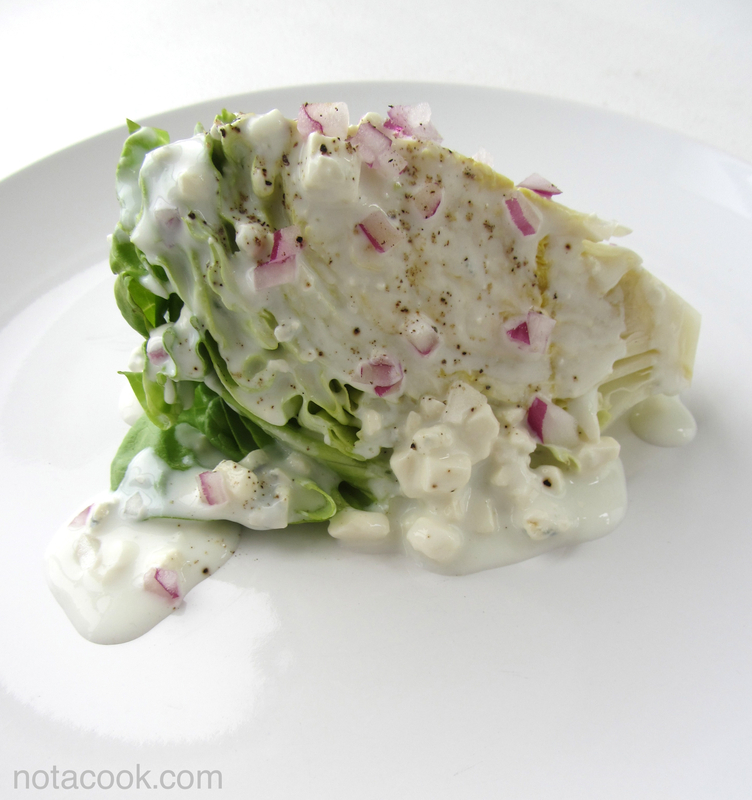 In the world of heavy and dense creamy dressings (you know the ones I’m referring to: ranch, thousand island, green goddess, etc…) a good blue cheese dressing is always at the top of my list. It is not the usual choice of topping for most peoples’ salads, what with its distinctly stinky smell and mildly bitter taste. But it is that duo combination what I find to be so great when paired together with the tangs of buttermilk and sour cream. I admit, I was skeptical in the beginning, but now it is one of my favorite dressings. Give it a try; you’ll be glad you did! 1. Divide the head of lettuce into 4 wedges by cutting through the core, and leaving the base intact to hold the wedges together. Rinse the leaves and set aside to dry. 2. Finely dice half of the red onion. Set aside. Save the other half for another recipe. 3. In a medium bowl, whisk together the buttermilk, sour cream, sugar, and salt until smoothly blended. Stir in the blue cheese. 4. Lay the lettuce wedges cut side up onto the serving plates. Top with the dressing, then garnish with a sprinkle of red onions and freshly ground pepper. * Butter leaf lettuce is my preference because I like the texture, but you can also use other lettuces such as iceberg and romaine.